This stripy-tailed, masked bandit and raider of garbage cans sits perched to steal your heart. 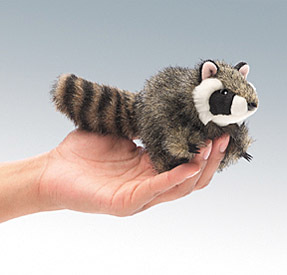 From his clever paws to the end of his bushy tail, this Raccoon finger puppet has the classic look of the always-in-trouble, but too-cute-to-punish. Measures 5" x 2.5' x 3".